Anime openings give us a snapshot of what to expect from a show. They are 90-second synopses of the atmosphere, whether peaceful (Ah! My Goddess! ), action-packed (Kill la Kill), or deceptive (Mahou Shoujo Madoka★Magica). Anime openings are the fingerprints of the series—the essence of what makes them unique. Or are they? 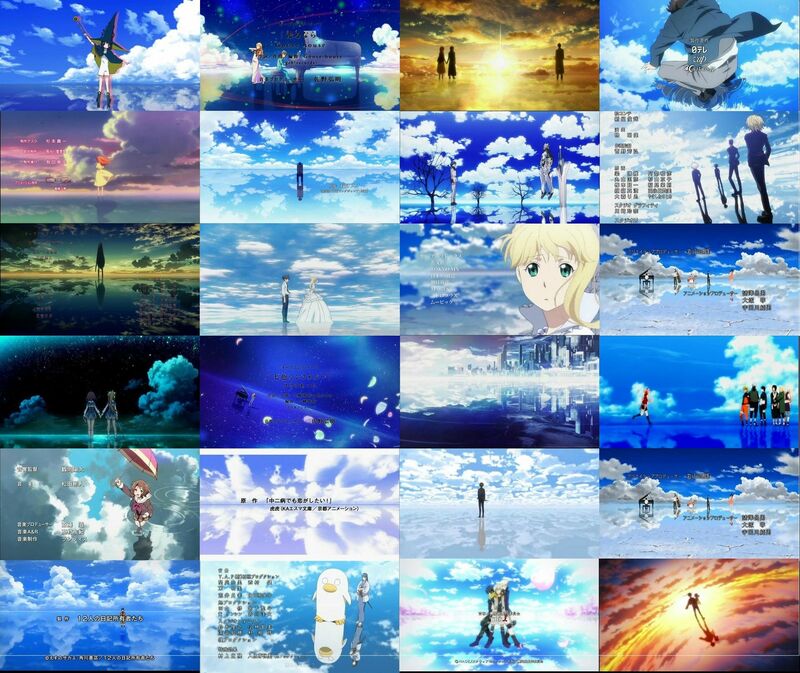 No matter what anime you're watching, odds are that you recognize one scene in particular from many openings: a dazzling blue anime sky with pure white clouds, reflected in a crystal clear body of water. Sometimes it'll be just that, and other times you'll see the anime's characters standing in the middle of this vista. But where does it come from? What does it represent? And why does it pop up seemingly everywhere—even in sports drink commercials? Let's talk about this motif and what it can tell us. If you clicked that last link up there, you saw a commercial for a sports drink called Pocari Sweat. 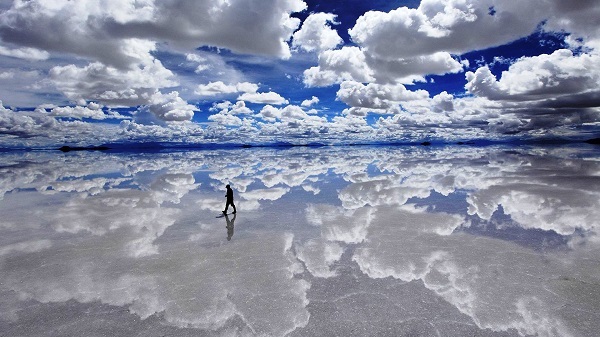 The beautiful landscape is Bolivia's Salar de Uyuni, the world's largest salt flat. Rainstorms cover the salt flat in a thin layer of water; due to the water's shallowness and the pure white salt that it covers, the result is essentially a gigantic puddle that perfectly reflects everything around and above it. The reflection effectively doubles the size of the sky, and the view is so clear and unbroken that it can be hard to spot the horizon. It makes sense that they'd use it to advertise Pocari Sweat—it's supposed to keep you supplied with the electrolytes and minerals you lose when sweating, and what better place to find minerals than an enormous salt flat? Plus, it's flat—there's nothing stopping you in any direction. Total freedom. So anime openings, is that what this imagery is all about? Freedom? As common a narrative device as it is, in-depth analysis is surprisingly sparse, at least on the Western Internet. But other motifs involved in the "salt flat" shot can offer clues. Ripples in the clear water hint at fate and consequence; the smallest actions can have the most serious repercussions. Mirrors and reflections indicate illusions and revelations. See the wind blowing across the water? That means there's a storm coming. Whether the water is still or disturbed, the "salt flat" opening is familiar by now, but it's familiar for a reason. Let's look at how some of these anime sky motifs fit into the stories of the shows they appear in. This one's easy, especially because the anime opening theme is called "Heavenly Blue." It's a song about reaching for one's dreams, even if you don't know what the future has in store. Princess Asseylum of Mars wants peace with the beautiful planet her home was at war with; as the picture above shows, however, her desire for peace is caught in a cycle of violence, pride, and corruption. The opening contrasts shots of war and conflict with tranquil scenes—even directly referencing the salt flat—but by the end, it's clear that they are doomed to clash. 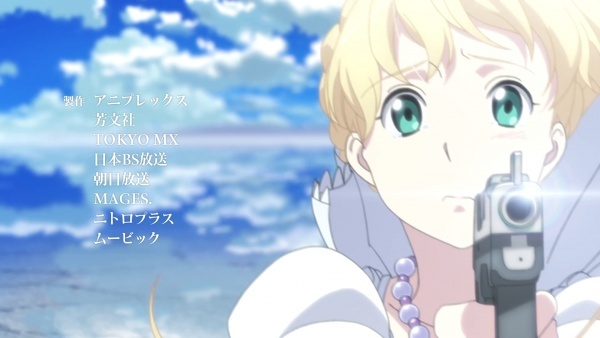 In Aldnoah.Zero, nowhere is truly safe. 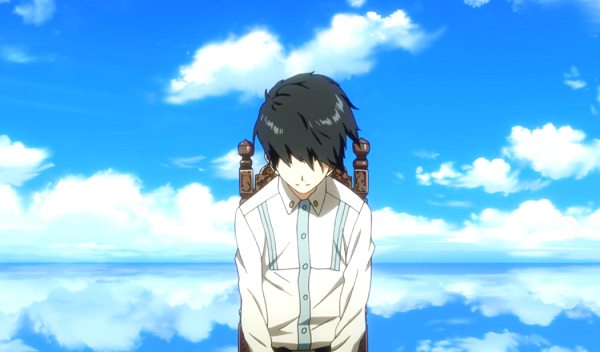 The beautiful anime sky motif matches the central theme of the series perfectly. This sequence is as close to thematically perfect as it gets—even outside of the blue dreamscape of the anime sky motif, every character that appears is depicted next to their reflection. It's an introduction to the show's defining struggle, in which Kaneki seeks a balance between the human and ghoul parts of himself. The foreshadowing is particularly striking toward the end of the opening: rather than looking at his reflection, Kaneki helplessly falls into it. In barely a minute and a half we see him start out human and be irreversibly transformed into a ghoul. His white-haired self doesn't even appear until the very end of episode 11, making the opening a compressed retelling of the entire first season. Duality again with this thrilling anime opening, though slightly different from that of Tokyo Ghoul. The sequence climaxes with our favorite anime sky motif again: beautiful skies reflected in shallow water, with each character standing triumphantly over their reflection. Everyone has something hidden in their past that drives them to kill in the name of the greater good, and many of them are forced to confront it. Pay attention to the shot of Akame: she is transported from the flat, reflective salt flat to a vantage point on a mountain. Though her past traumas played a major part in her life's journey, she is capable of rising above them. The first episode of Charlotte is one of the most concise, dynamic story arcs of the summer 2015 season. Yuu Otosaka's power of possession launches him to the pinnacle of his school career, only for him to lose it all and find himself at the mercy of the Hoshinoumi Academy student council. 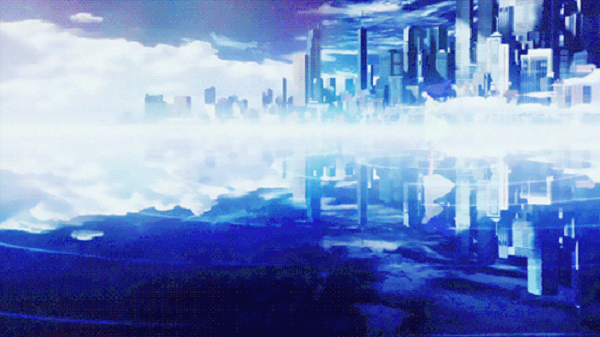 It gives context to the anime opening when it plays for the first time in episode 2: the city's reflection in the water hints at a side of Yuu's world he never imagined could exist. As he and fellow super-student Nao Tomori fall through this azure space, they reach for the only landmark they can find: each other. This anime sky motif is used to beautifully portray hardships as well as love making this one of the most heartbreaking anime openings ever. So many anime openings to choose from. I mean, Naruto Shippuuden has 19 seasons! This is true, but the still from the collage at the top is from the OP track 9 "Lovers" and is full of beautiful anime sky motifs and is just one of this trope's many appearances in the show's numerous opening sequences. 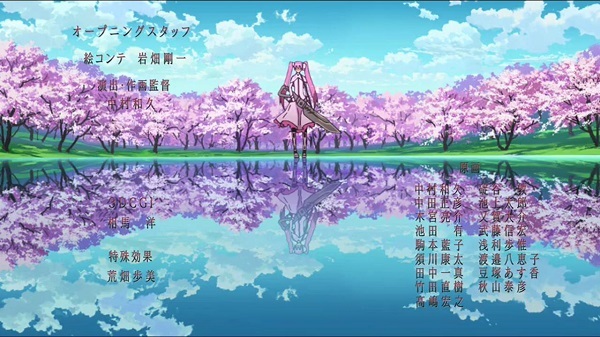 Sakura runs toward her companions, their reflections in the water hinting at shadows from their past and present lurking beneath the friendship on the surface. Ominous, certainly, but counterbalanced by Naruto in the above image. He's not threatened by a reflection on the water's surface—he's running on water and making waves of his own. You don't decide what circumstances you deal with, but you do have the power to change them, and that's exactly what the cast of Naruto: Shippuuden does. Like any teenager, budding euphonist Kumiko Oumae has plenty of embarrassment to get over, and the biggest source is losing her junior high band competition. That lack of self-confidence dogs her through high school, compounded by the school band's inability to function as a whole. It's appropriate, then, that the opening features the band's members dealing with a rainstorm on their own. 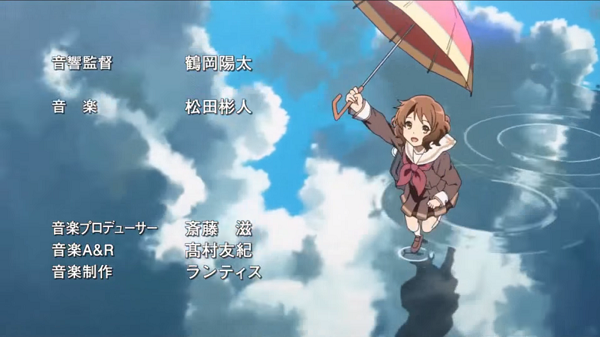 But when the anime sky clears, we're treated to Kumiko running with her umbrella, laughing all the way. And yes—she's on a reflective, dazzling, blue surface. As the symbolism goes, Kumiko's got performance hang-ups and confidence issues, but she refuses to sink—or to get any wetter. The meaning of the title Your Lie in April doesn't really become clear until the very end, and it won't be spoiled here. What is safe to say is that every experience shapes the person you become, and main character Arima Kousei is no different. His mother's sudden death may drive him away from the piano, but Kousei finds his way back to his passion through love and friendship. 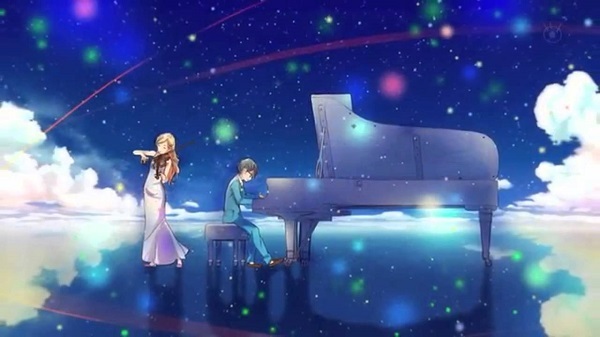 Young violinist Kaori Miyazono becomes his muse, and they are seen playing together in the opening's stunning vista of blue. But even there, we are treated to a murky reflection just below their harmony. Every light casts a shadow and eventually goes out, but this sequence invites us to find beauty in even the darkest of places. Thanks to the beautiful blue anime sky motif and the gentle music, this song has become one of the most popular anime openings of all time. There's a tried-and-true formula to anime openings: cut from action to stillness, showing multiple sides of your characters and plot, and most importantly, somewhere in there the anime sky has to be reflected in a salt flat. Tokyo Ghoul does it, Hibike! Euphonium does it, Naruto: Shippuuden does it... it's almost easier to list the anime that don't use this anime trope in some way. But that doesn't detract from the originality or power of these stories. Clichés are only truly bad when they dictate the course of a story, not the other way around. Though we expect certain things from familiar symbols, how they are used is a much more important question than whether they are used, and each appearance plays a different role depending on the anime that uses it. Though it's common enough to seem like an industry standard, every show puts its own spin on the anime sky shot, and it isn't going away any time soon. It's a narrative tool like any other, and it's good for as long as animators can find new uses for it. The anime sky is the limit in the world of anime openings! Some anime OPs and EDs are awesome; others forgettable. And then there are those that leave you feeling uneasy and creeped out. Here are 12 of the creepiest anime openings and endings… and we mean that in the best possible way.